From about 30 B.C. to A.D. 70 (some scholars extend these dates to as late as A.D. 135), ossuaries were used by the Jews in secondary burials. Numerous of these stone receptacles have been discovered. Most of the dead were first buried in caves or rock-cut tombs. After the flesh had decayed, the bones were placed in an ossuary or “bone box.” This provided space for more burials. The Hecht Museum at Haifa University has a nice display of ossuaries. Six of these have lids on them. The lid is missing on five others. Display of Jewish Ossuaries in the Hecht Museum. Photo by Ferrell Jenkins. This was a prevalent custom in this period, and one that tied in with the strengthening Jewish belief in the individual, physical resurrection of the deceased from within one’s skeleton (Mishna, Sanhedrin 6:5-6; Babylonian Talmud, Sanhedrin 47b). This is the description of the ossuaries. The ossuaries are carved of local soft stone (chalk), and most of them lack ornamentation. Ornamentation, if it appears, was executed by carving, incision, or painting. The variety of decorative patterns on the ossuaries includes floral, geometric and architectural patterns. Some have Hebrew, Aramaic, or Greek inscriptions stating the name of the deceased. The top of the sign shows some of the decorations found on ossuaries. Note above, the statement that most ossuaries lacked ornamentation. 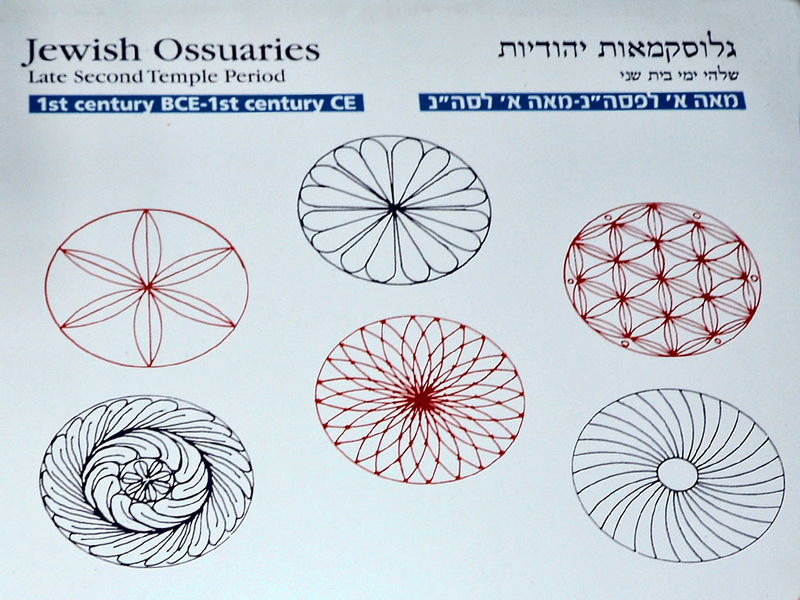 Decorations found on Jewish Ossuaries. Photo by Ferrell Jenkins. 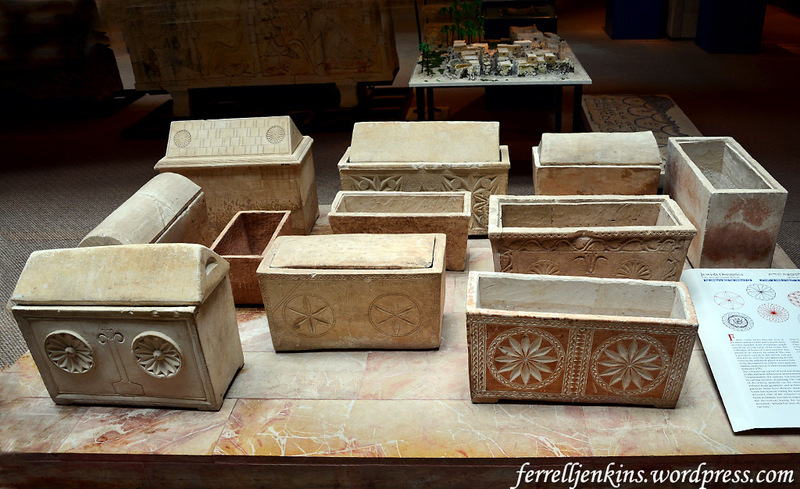 These ossuaries are small limestone boxes approximately 20 inches long, 10 inches wide and 12 inches high. Usually they have a flat, gabled, or rounded lid. All these ossuaries were used for secondary burials; approximately a year after the original burial, when the body had decomposed, the bones of the deceased were collected and placed in the ossuary. (BAR, July/Aug. 1979). Stone cutting was one of the main occupations of ancient Israel, and some stone cutters evidently specialized in made-to-order ossuaries. In a future post I plan to show a cemetery filled with ossuaries. This entry was posted in Archaeology, Bible Places, Bible Study, Israel, New Testament, Travel and tagged Ossuaries. Bookmark the permalink.